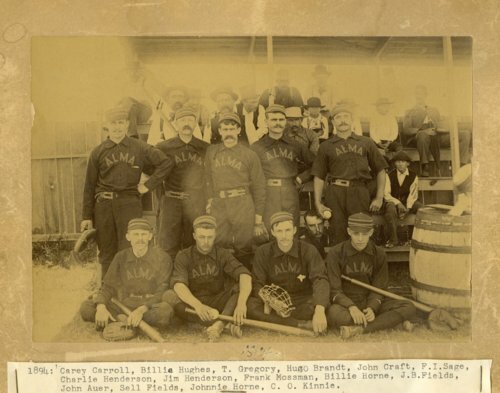 Photograph of members of the Alma baseball team are seen at this unidentified ball field. Identified are Carey Carroll, Billie Hughes, T. Gregory, Hugo Brandt, John Craft, F. I. Sage, Charlie Henderson, Jim Henderson, Frank Mossman, Billie Horne, J.B. Fields, John Auer, Sell Fields, Johnnie Horne, and C. O. Kinnie. The owner of the team is identified as Hal G. Weaver.